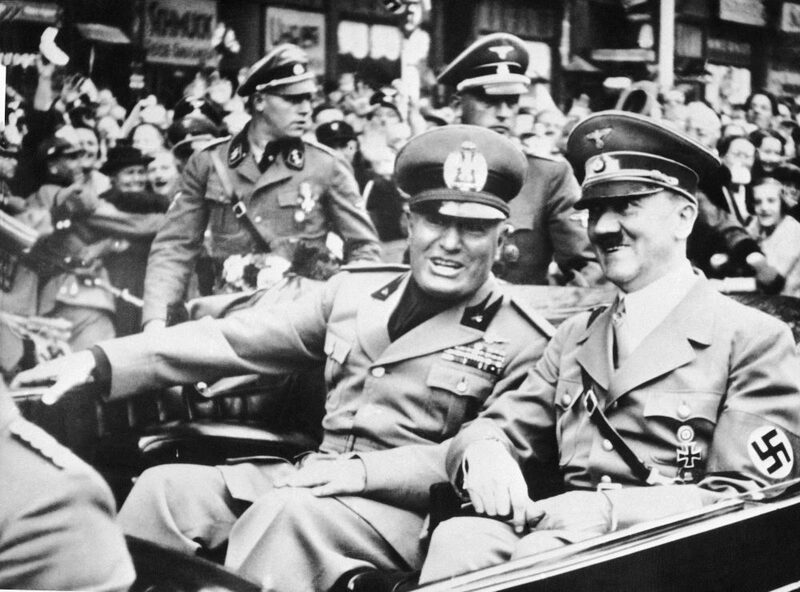 Italian dictator Benito Mussolini, at left in foreground, and Nazi leader Adolf Hitler, at right, on Sept. 28, 1938 showing just before the four power conference in Munich, Germany. Photo courtesy of Associated Press. Western democracy may be facing its biggest challenge since 1945. It’s easy to find parallels between Donald Trump, the UK Independence Party (UKIP), the French National Front, the Alternativ für Deutschland (Alternative for Germany–AfD), and many similar movements and the fascist and national socialist movements of the interwar years. Racism, extreme hostility to the left, and Trump’s hints that he might not have accepted a Hillary Clinton victory all suggest rebirth of an ideology that many people thought had died with Adolf Hitler and Benito Mussolini. Trump can hardly complain if his intention to deport millions of illegal immigrants reminds some of Hitler. Yet each of these movements in the U.S. and Europe claims to be the true expression of democratic legitimacy. The raison d’être of UKIP was a referendum on British membership in the European Union, and now its mission is to defend the “the will of the people.” As for Trump, his sensitivity to having been substantially beaten in the popular vote implies a conviction that democracy somehow matters. So are they fascist or not? And what does that tell us about where we’re headed? In principle, there is no problem with using the term fascism in debate—after all, we use terms like socialism or liberalism all the time. But we are able to use these terms because we realize that they can’t be defined once and for all. We know (or rather we implicitly accept) that there are many ways to be a socialist, for instance, and while some see it as a term of abuse, others are happy to apply it to themselves. The problem with fascism is that any use of the term functions as a political assault, and so leads to defense or attack through definition, and that distracts from real issues. Personally therefore, I use terms like “extreme right”—not because I think that people or groups “scientifically” belong to the category, but because we can use the term knowing that it can mean very many different things. In the end, politics (and life) proceeds through misunderstandings and unintended consequences—which historians try to explain retrospectively. After decades of research, academics—myself included—have been unable to agree on the proper definition of a fascist. Some see it as a conservative ideology, protecting property and capitalism; others see it as reshaping society in the name of revolutionary nationalism. Neither can academics agree on whether national socialism (commonly called Nazism) was a form of fascism. Some emphasize the many similarities (dictatorship, anticommunism, antiparliamentarianism, and so on), while others argue that Hitler’s drive to create a racially pure state through extermination of minorities was significantly different from the expression of fascism in Mussolini’s Italy. Even those who embraced the moniker did not agree on what fascism was. Fascism—like socialism or any other political movement—was diverse and meant different things to different people. Among those Italians who described themselves as fascists between 1919 and 1945, there was an enormous range of views on what fascism was. It’s not surprising that academics cannot say which of the many fascist factions or movements represented the “real” fascism (was it the Brownshirts or the SS for instance?). However, our specialist knowledge and training as academics makes it possible for us to say what is similar and different about modern groups. Scholars can also trace the different meanings and their consequences. Mussolini’s supporters represented a minority in parliament and needed conservative support to form a government. They got it not just because conservatives sympathized with fascism (their views were mixed), but because fascist paramilitaries had waged a campaign of systematic violence in town and country, and were already the de facto government in some areas. The Blackshirts began a “March on Rome,” which persuaded conservatives to do a deal with Mussolini, making him head of a coalition government. The use of violence stretches the definition of legal. Hitler and others were terribly impressed by this precedent, but reinterpreted it. In the Beer Hall Putsch of 1923, he failed to carry out his own “March on Rome,” that is, an attempt to carry out a coup. Reflecting on this reversal, he concluded that electoral methods were also necessary. Hitler’s Brownshirts were not as murderous before they came to power as the Italian Blackshirts were, but in Germany, too, both paramilitary pressure and parliamentary deals brought the Nazis to power. The problem with fascism is that any use of the term functions as a political assault, and so leads to defense or attack through definition, and that distracts from real issues. These debates had real consequences for people. For example, after the Nazi seizure of power, the SA demanded a second revolution, which meant, for instance, making the SA the core of the army. Some officers were alarmed, while others welcomed this infusion of nationalism. On July 2, 1934, Hitler ordered the execution of several SA leaders—but the action was carried out by the SS, marking the arrival of a new actor in the struggle to shape Nazism. Historians do their most valuable work when they trace these conflicts and their consequences—they don’t (or perhaps shouldn’t) try to decide which of these groups had the correct definition. Nevertheless, many academics do still claim to have correctly defined fascism. In my view they have misunderstood the role of categories in the human sciences, but it’s not necessary to go into that here. More relevantly, the reason they do so is that there is a “market” for such definitions. The reason is quite simple: Fascism is the ultimate term of political abuse; nobody wants to be a fascist, and it’s a tempting label to stick on others. Consequently, everyone defines fascism in a way that excludes themselves and includes their enemies. For instance, opponents of Donald Trump have said that the implicit appeal to violence makes him fascist. Defenders of Trump say that fascism is actually defined by state control, and so Obamacare is the real fascism. So what are the similarities and differences between fascism, Nazism, and the modern far right? Confining our attention to the question of legitimacy, the modern far right, like the fascists and Nazis, claims to represent “the people” against the “liberal elite,” especially the press. Trump boasts that he takes his message directly to the people. Indeed, Trump’s words sometimes seem like a direct borrowing of Nazi terms. The President’s expression “lying press” echoes the slogan of Pegida and the AfD in Germany, which in turn echo Nazi denunciations of the “lying press” (Lügenpresse). Another similarity is the support for the modern far right of often wealthy and powerful conservative elements—in neither the U.S. nor Europe is the far right simply a movement of the disaffected working class. There are well-documented struggles within far-right movements to define its direction. Notwithstanding the populism common among the far rights of then and now, a major difference is that these days there is no equivalent of the mass paramilitary movement, able to subvert constitutional politics by the threat or reality of violence. Of course, there are violent tendencies within modern movements, encouraged by Trump among others. The racist language of the far right encourages attacks on minorities, and there are violent groups attached to movements such as the English Defence League. But the far right these days has not engaged in the systematic destruction of trade unions or socialist local governments and other potential threats to their power that happened in Italy. In Germany, Nazi violence prior to winning power was much less extensive, but in power it went much further than the Italian regime. The contemporary decline of paramilitarism is due partly to context—in the interwar years, millions of men in Europe and the United States had fought in World War I, and many of them believed that the values of the front should re-shape the social and political system. Another reason for the decline of paramilitarism is that in the 1970s and 1980s, the then-marginal far right deliberately re-defined their movements, by attempting to distance themselves from violence, and by adopting the languages of liberal democracy instead. They now demanded the “rights” of all ethnic groups to preserve their identity—thus white nations supposedly required protection from immigration. In other words, they co-opted the language of rights and democracy. In effect, the modern far right exploits the discriminatory potential of democracy, interpreting it as a sort of dictatorship of the majority, in which judges serve not the law, but the democratic majority. They separate democracy from pluralism, respect for minorities, and the rule of law. And finally there is the fact that politicians are aware of history, and it shapes their actions in the present. Protests against Trump and others are motivated partly by the fear of a return to the 1930s. Conservatives, too, have the past in mind. In Germany, above all, many conservative politicians outspokenly oppose the far right, not wishing to repeat the mistakes of the 1930s. Interestingly, in the depths of the crisis in Greece in 2013, which looked worryingly like interwar crises, the conservative government chose to arrest the leaders of Golden Dawn rather than ally with them. In France, on the other hand, many conservatives have proven willing to compromise ideologically and practically with the far right, claiming that it represents not fascism, but the values of frustrated ordinary people. Where these conflicting tendencies will lead is uncertain. Knowing the past does not allow prediction of the future. The policies of the modern far right are not to be judged on the category to which they belong, but on whether they are morally right, and that is a question not just for academics, but for society as a whole. In that respect, it is worth bearing in mind that the crimes of fascists, Nazis, and indeed others, depended on the willingness to assist, or just look the other way, of people who did not consider themselves to be political at all. Kevin Passmore is a professor of history at Cardiff University and the author of A Very Short Guide to Fascism.